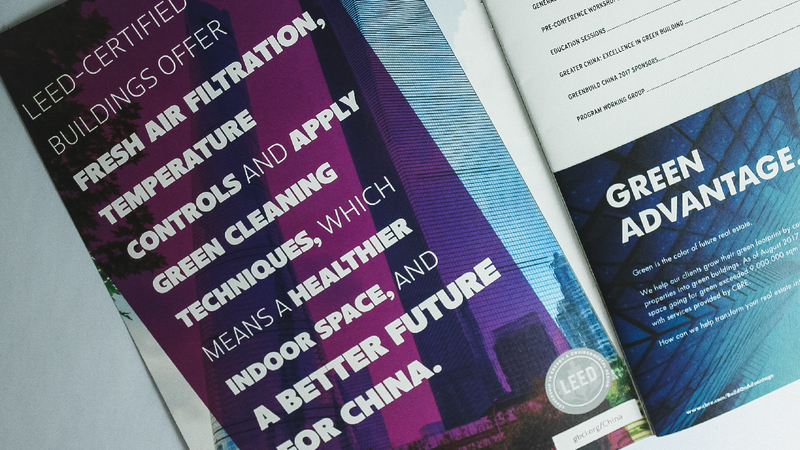 Last year, the USGBC design team was tasked with creating a new print ad series for both China and India. We had a goal to make LEED feel more localized, indigenous to China and India, and integrated with the issues the country is facing. The ads would focus on various issues that LEED addresses, including energy, indoor environmental quality and water/waste issues. The key audiences we wanted to reach included building facility managers, LEED clients, manufacturers of building materials and LEED APs, just to mention a few. As I designed these pieces, I wanted to focus primarily on photography, with typography as a secondary design element. We had statistics that covered issues about water, air quality and energy use, so I wanted to use these a typographical elements rather than just supporting copy on the ad. First, I had to source photos that felt relevant to the locations, as well as to our audience. I chose a bright and bold color palette to complement the photography and help the copy stand out as an overlaid design feature. 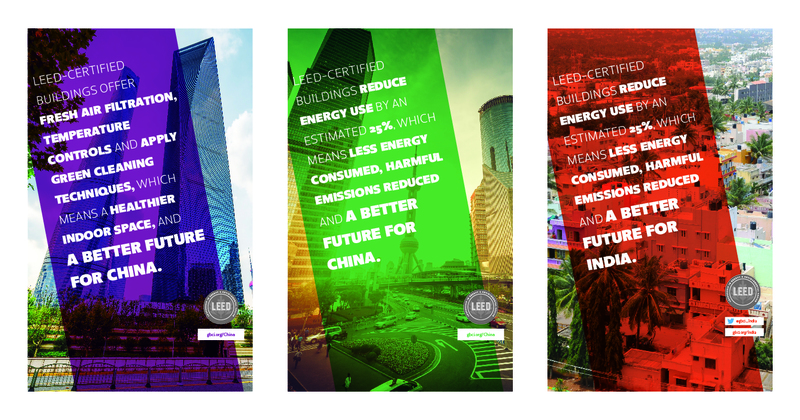 In our final designs, I really wanted people to take away the line “a better future for India” or “a better future for China.” The goal I focused on was showing that LEED-certified buildings can help address some of the main issues both locations are facing daily. The final ads we have been running show off high-quality photography and bold typography and create a dynamic layout for viewers. 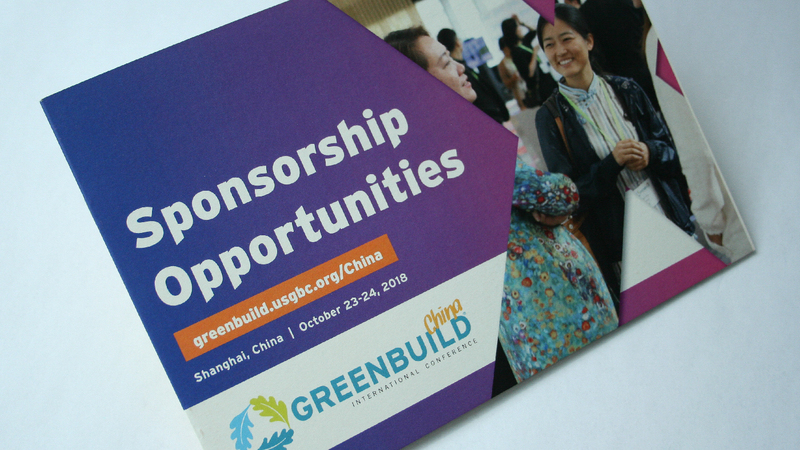 If you want to read more about our efforts in both India and China, visit gbci.org. As USGBC and GBCI, we take pride in celebrating our program milestones. 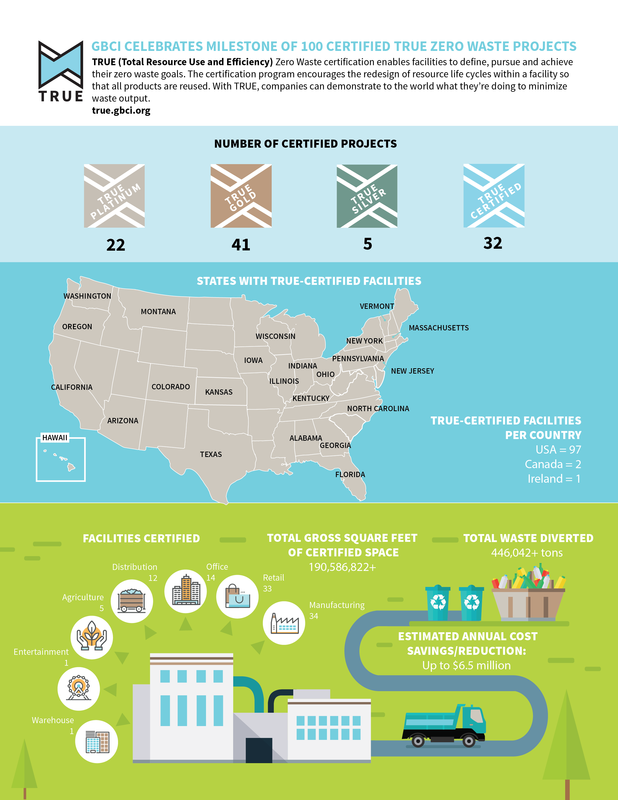 That’s why we created an engaging infographic to highlight the first 100 certified TRUE Zero Waste projects. Our target audience was current TRUE participants, program prospects, the media and the waste and sustainability communities. The infographic visually represents data about TRUE. Designed for social media, presentations and media outreach, the infographic is a fun and creative way of pointing out what it means to be TRUE-certified. 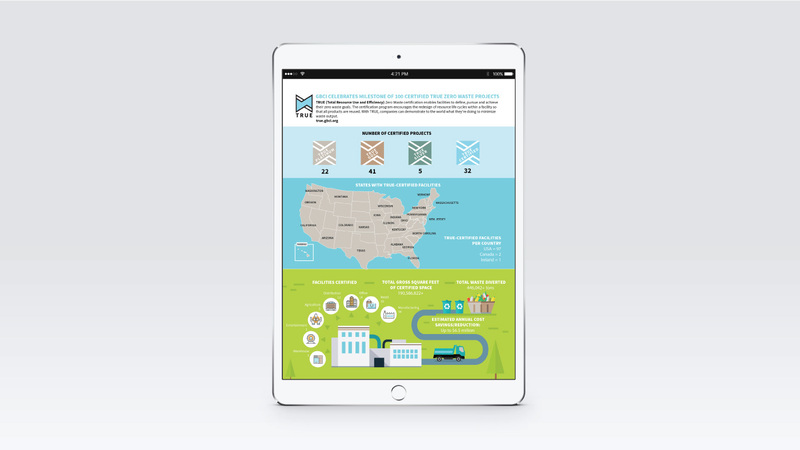 How the infographic appears on a mobile device. Read more about TRUE-certified facilities in the project directory. This spring, our USGBC design and marketing team decided to switch gears with our current SITES advertising campaign. SITES is used by landscape architects, designers, engineers, planners, ecologists, architects, developers, policymakers and others to align land development and management with innovative sustainable design. Because SITES touches so many different people, we decided to focus on people themselves, to drive home the connection to the professional. Currently, the SITES team is highly focused on growing the credentialing program. They are interested in driving registration for the SITES AP exam, and the new print ad needed to support that goal. The SITES AP establishes a common framework to define the profession of sustainable landscape design and development and provides landscape professionals with the opportunity to demonstrate their knowledge, expertise and commitment to the profession. When designing, I always start by pulling as many photography options as I can before moving into layout. I pulled 16 different photos, and then started laying out the ad with the given copy. 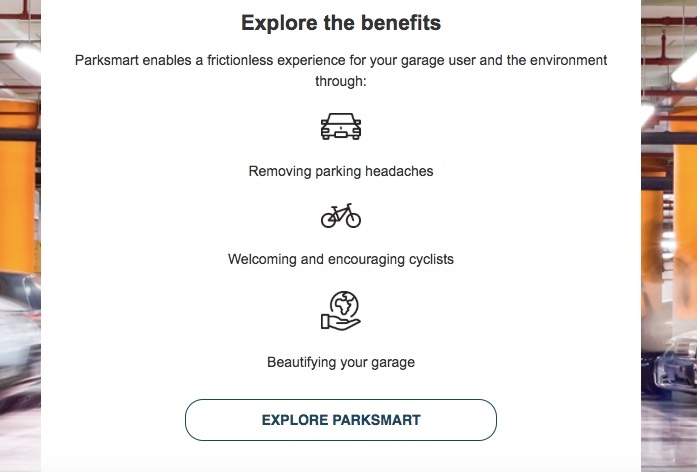 I went through three design rounds before landing on two final layouts that connect with the SITES audience. Next, I decided the photos and typography could stand alone, without any additional design elements to tell the SITES AP story. The ads are simple and concise, and the message is clear. Check out the project over on our Work page! 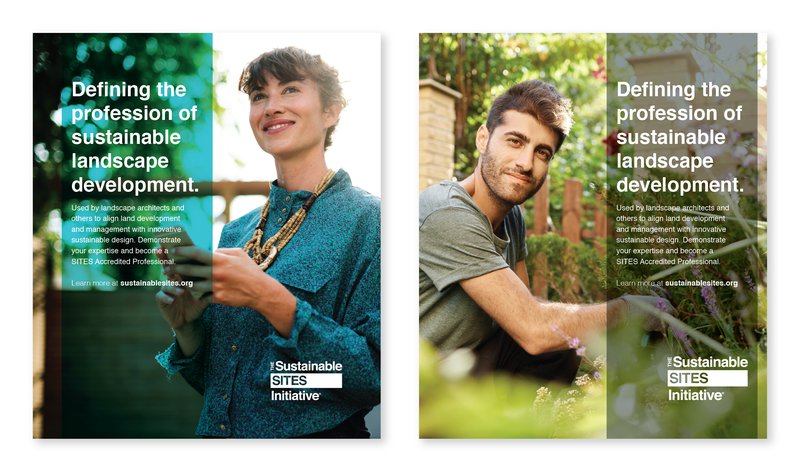 You might find it unusual that an organization so focused on the environment would design printed marketing collateral. In this “print to digital” day and age, why would you rely on paper to promote your message? 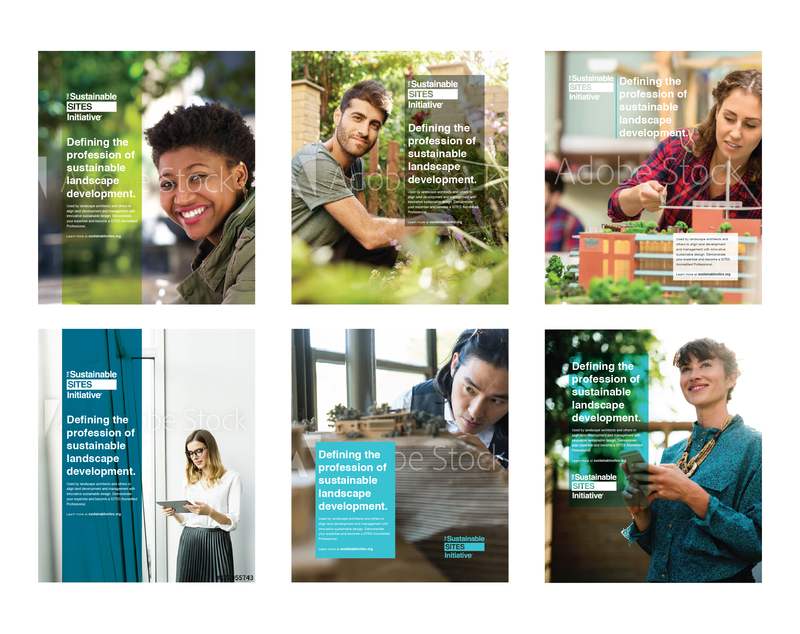 While curbing wasteful printing has always been a priority for our USGBC marketing and communications team, sometimes paper speaks louder than a screen. In fact, science shows that paper can be more effective and memorable than digital. 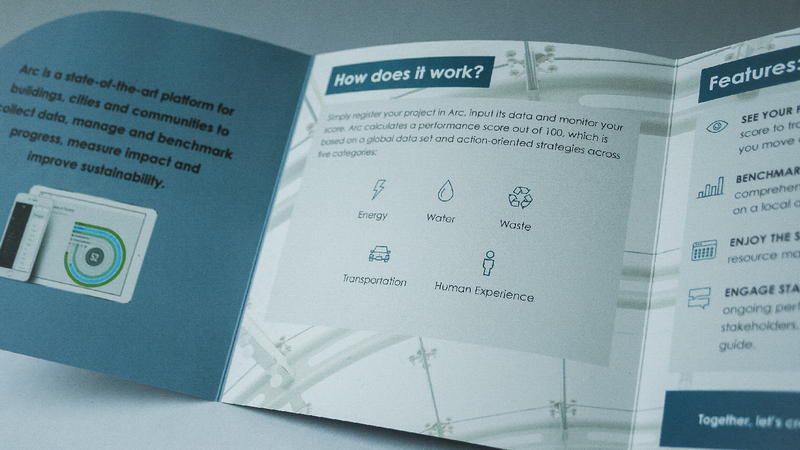 When we sat down to strategize our marketing for Arc, a digital platform designed to help building projects collect, manage and benchmark their performance data, we knew we needed to supplement our heavily digital-centric marketing with a standout print brochure. The goal was to create an impactful leave-behind to complement the team’s sales efforts. 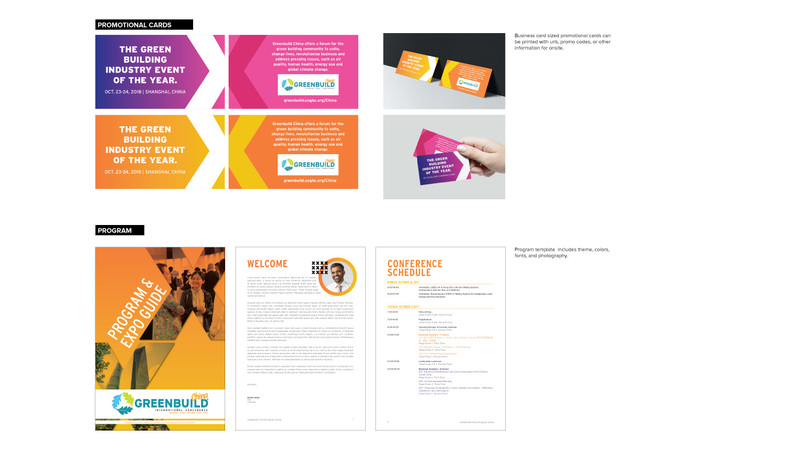 The brochure would be used in meetings and presentations and distributed at various events. The team got started on the design, aiming to have the brochure ready for distribution at Greenbuild Europe, which took place in April in Berlin, Germany. 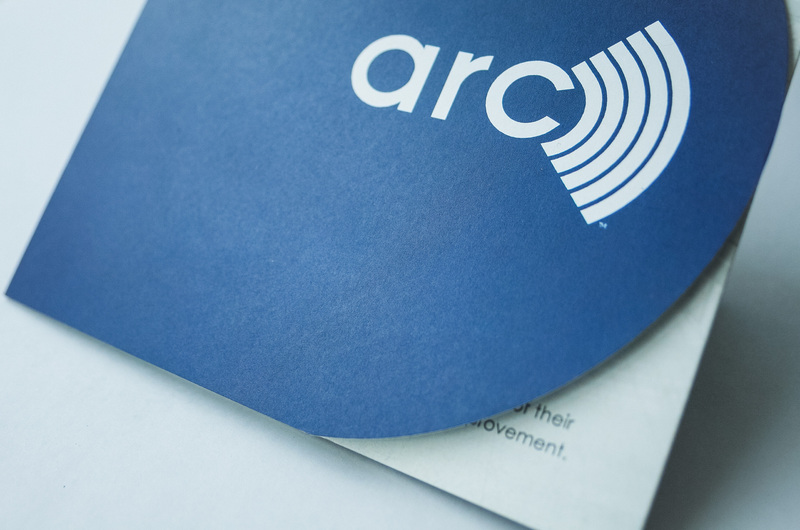 The trifold design brochure conveys Arc’s innovative and data-centric functionality, with simplicity and ease of use. Its compact size (5.66 by 16.98 inches) is portable, but large enough to accommodate the perfect amount of information, so it’s useful to our customers. 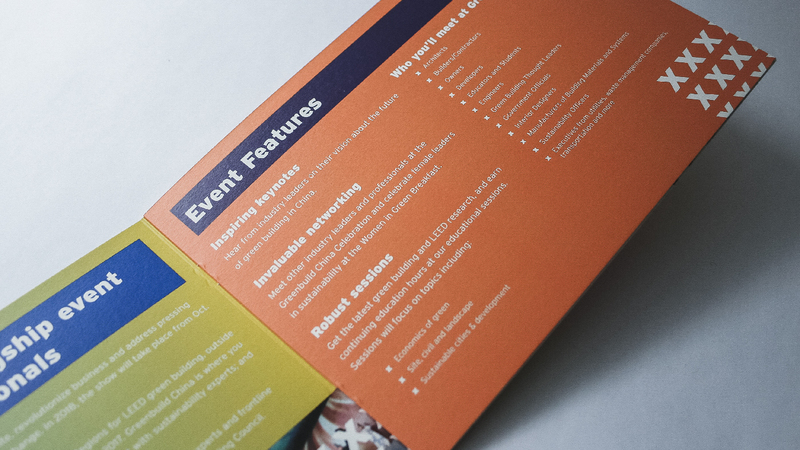 The die cuts add dimension and make the brochure eye-catching and modern. Per our printing guidelines, the brochure was printed on Mohawk Options paper stock, using soy-based inks by a local FSC Certified printer. As part of the USGBC marketing and communications team, two to three people handle our social media marketing for USGBC, LEED, our GBCI family of brands and associated accounts like the Center for Green Schools. Across our social media platforms, they balance the needs of creating fun social engagement opportunities with sharing important announcements and keeping a consistent tone. I use Hootsuite’s services from time to time, which is originally how I became familiar with their blog. It’s one of the very few that I subscribe to with my regular work email, because I appreciate the content and find it useful for digital content knowledge well beyond the realm of its core services. Also, they offer free webinars galore! They’ve been around for a long time, and I think that counts for something. I’m a huge fan of the knowledge that TrackMaven features regularly on its blog. As a customer of TrackMaven’s analytic software, I trust them as a resource and value what they are about as a company. I subscribe to this blog in my email, but I also love visiting their website (something I can’t say about every company!). I’m new to Sprout Social, but am digging it already! Their design style is great, and visually appealing content is always a plus. They have excellent, relevant resources with digestible and creative delivery. They also look at social in broad contexts and include a lot of information specific to community and project management. I look forward to using their tools more often. I like the Social Media Today blog—whether it’s an overview on a new feature released on Facebook or just a quick how-to guide on navigating a certain function, this website is a good down-and-dirty resource for getting a basic understanding of hot topics quickly. Another similar resource is Social Media Examiner. As the line between marketing and PR continues to blur, it’s important to expand the industry or trade publications you’re referencing. Sources like PRWeek and AdWeek are not only good for staying on top of what’s happening in the industry, but they also provide in-depth looks at current and recent campaigns. Seeing what others are doing can help spark ideas for how you might leverage social media to support your own goals. Follow the experts. Those who are leading social media efforts for brands should also be on your “must follow” radar on Twitter. Their insights, tips and work are powerful lessons. Try the aumcore list of thought leaders to get you started. TRUE, formally ZeroWaste, is a whole-systems approach aimed at changing how materials flow through society, resulting in no waste. TRUE Zero Waste promotes processes that consider the entire life cycle of products used within a facility. Because of the various trademark challenges, the ZeroWaste brand needed to be renamed and rebranded. Originally, the creative brief for this project toggled between two options for the new name: “Minuswaste,” which does not include the zero waste terminology and was difficult to trademark, and “TRUE,” which stands for Total Resource Use and Efficiency. I began my usual three-step process for developing this new identity: research, sketch, revise and finalize. It’s important to see what’s already in the ether of logo design. What’s trendy right now? What’s classic? What styles really work for the industry? What is the client’s mission? Once I had a solid understanding of ZeroWaste’s mission, it was time to get the best possible understanding of what the client does to achieve this mission and who the target audience is. I created new versions of the initial ideas, based on the feedback given by the client. The final logo embodies a nontraditional, continuous cycle using bold, clean lines. 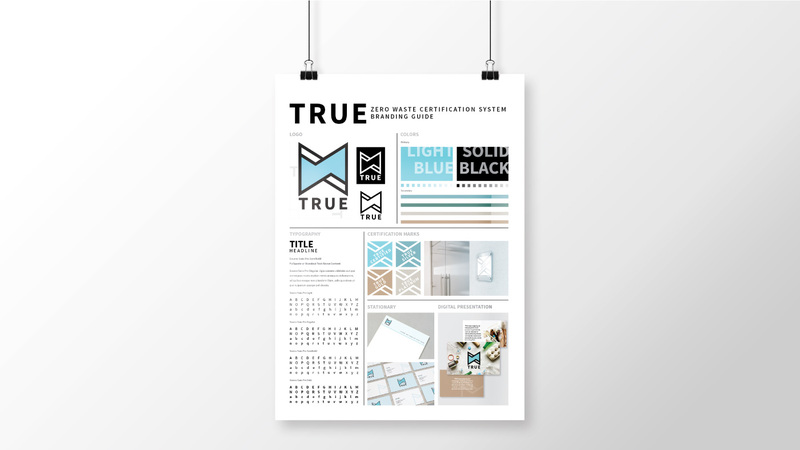 Ultimately, the redesign achieved a clean, minimalist design while maintaining the integrity of TRUE’s mission. The new identity is flexible to adapt to all media and presents a modern, professional aesthetic for longevity. Feature image: Photo by Amanda Gann, courtesy of AIGA DC. I’m so excited to finally share the news! Our TRUE Zero Waste Certification System branding package, designed by USGBC’s senior graphic designer, Nia Lindsey, was recognized by AIGA DC as one of the 50 best created in Washington, D.C., over the past two years. AIGA 50 honors design that makes an impact, and over 400 entries were submitted for the 2018 competition. Many from our team were able to accept the award in person at the 15th biennial AIGA 50 Gala, where we rubbed shoulders with some of the top creatives in the area. View all the winning work from 2018. TRUE Zero Waste is a program for businesses to define, pursue and achieve their zero waste goals, thereby reducing their impact on the natural environment and our collective health. With that in mind, the goal was to create a logo and brand that was innately simple and minimal, while at the same time flexible and adaptable. 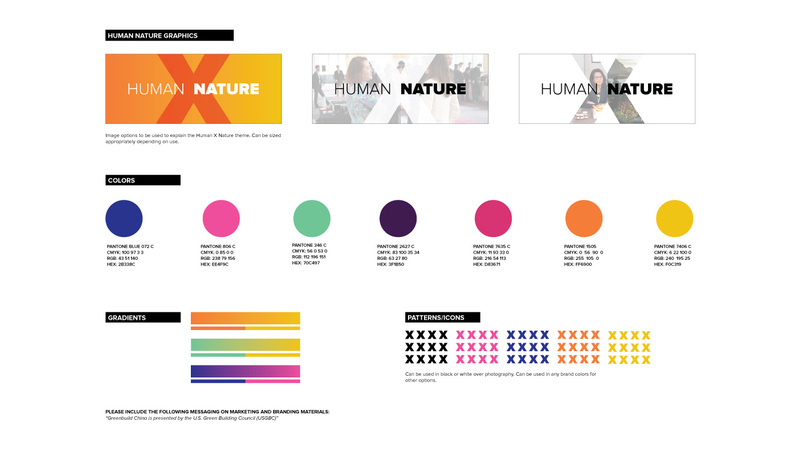 The final logo embodies a nontraditional, continuous cycle using bold, clean lines.